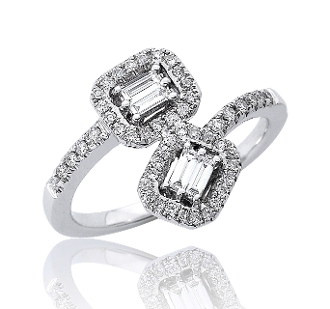 Brilliantly done, treat yourself or your loved one to 0.42 Carat t.w. of Diamonds on this right hand ring. This ring features a split bypass shank with pave set Diamonds meeting in the middle with prong set baguettes frame in pave set solitaires. For added appeal personalize your item, select our Engrave option and indicate size needed when adding to Cart.